Discover Wilderness Canoeing in Rogen is the ideal canoe tour for those who have suitable outdoor experience but have not done a canoe tour in such a remote region before. This self-guided canoe adventure offers you a convenient and flexible way to discover the unique paddling opportunities of this stunning mountain area in north-west Sweden close to the Norwegian border. There are some great options for day hikes during the tour if you wish to spend some time off the water. Photo: Charlotte Debrenne. 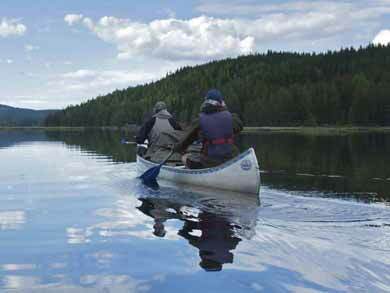 Discover Wilderness Canoeing in Rogen has a choice of two main variations. You will be picked up from the end point 4-8 days or more later depending on the length of tour chosen. Option 1: Start/End Käringsjövallen: You can choose to start and end your tour in Käringsjövallen, that is starting and ending your tour at the same point. As there are no requirements to cover a minimum distance, these canoe tours give you the greatest flexibility in terms of level of challenge and distance covered. Option 2: Start Käringsjön end Käringsjövallen (or vice versa): We recommend min. 5 days/4 nights for this option. As a point-to-point tour, there is a minimum distance to cover, but also great flexibility to explore additional parts of the reserve depending on time available. For either option, you have a choice of route variations for your canoe tour depending on the time available, your own experience/fitness levels and weather conditions. You may decide to explore the system of small tarns up towards Rödsjön and Skedbro, paddling further out towards Rödviken. There is a network of camping spots to choose from, where fires are permitted. Photo: TS. If weather conditions permit, the northern end of lake Rogen offers wonderful paddling with sandy bays, clear water and glorious views. And for those with a love of fishing, the area is marvellous for grayling and trout! Alternatively, spend some time in the lovely Perch Bays area, where knarled pines dot the landscape. This area is also very good for grayling, and has a number of wind shelters where you can make a fire to cook your catch! Rogen is an area of complete wilderness with virtually no infrastructure and very limited access. No previous canoeing experience is required, but you must be used to and proficient in travelling independently in remote areas and have a general good level of health and fitness for this experience. Accommodation is wild camping along the route. There are also a limited number of wind shelters at various points where, if vacant, you are welcome to spend a night. These are also the only places in the reserve at which it is permitted to make a fire. In addition to a number of smaller transports, for tours starting or ending in Käringsjövallen there are portages of approx. 700m and 500m required. Depending on the route chosen, the tour will also involve additional portages of 100-500m. 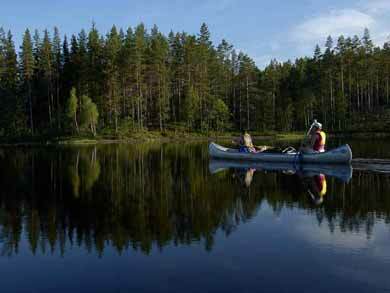 Discover Wilderness Canoeing in Rogen is a challenging but accessible canoe tour suitable for couples, groups of friends and active families with suitable outdoor experience - a real canoeing adventure in the Swedish wilderness! The area in which this canoe tour takes place offers excellent fishing. Using fly-fishing or spin-fishing techniques, large trout, grayling and pike may be caught. Each year perch weighing more than 1.5 kg are caught. Fishing licences covering the areas in which you plan to paddle can be purchased from the canoe centre on arrival. Fishing equipment is available to hire as an optional extra. Detailed information you will need for your experience is sent out once full payment has been received. Depending on terrain, strength, etc, you will normally need to walk carries twice - once with your rucksacks and packing and the second time carrying canoe, buoyancy aids and paddles. Do not risk injury by attempting to carry too much in one go. It is better to take your time and make additional trips. Go immediately to the canoe centre for information at 12.00. You will have an opportunity to shop for provisions, purchase any fishing licences, etc, before transfer to the start point at 13.00. Your paddle adventure begins with a long carry of around 700m to a series of lakes known as the West Wings (you will do this carry in the other direction at the end of your tour). The path is well-marked and goes over stoney terrain with some boardwalks. There is a jetty ideal for launching your canoe. To continue your tour deeper into the reserve requires a carry of around 500m to the lake at Tandsjön, followed by shorter stretches of paddling and carrying to reach the larger lake of Rogen. Alternatively, head east to explore the Perch Bays, a beautiful system of lakes offering marvellous paddling through small sections of rapids (normally max. grade 1) and flat water. NB: Depending on arrangements for local transfers for your start day, you may do this tour in the other direction, that is starting at Käringsjövallen and ending in Käringsjön - this cannot be fixed in advance. Information on the direction of your tour will be given on arrival. We recommend minimum 5 days for this tour. See Option 1 above for description of Käringsjövallen section. A series of shorter carries and a longer carry of 400m is required for the stretch between Lake Rogen and Käringsjön. 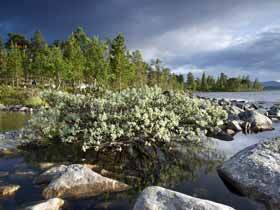 If time permits, take the chance to discover the many small tarns between Käringsjön and Rödviken to the south-east of Skedbro - a route involving a number of carries, one of which, around 500m over bog, is very challenging. This route is a fantastic experience offering many choices of overnight spot and beautiful paddling through a labyrinth of peninsulas and islands. This region also generally offers more sheltered weather than other areas. We recommend using the first days of your tour to explore the many bays of the lake system. There are one or two lean-to shelters in the area where you can spend the night and also make a fire. This is also an excellent area for pike and grayling fishing. 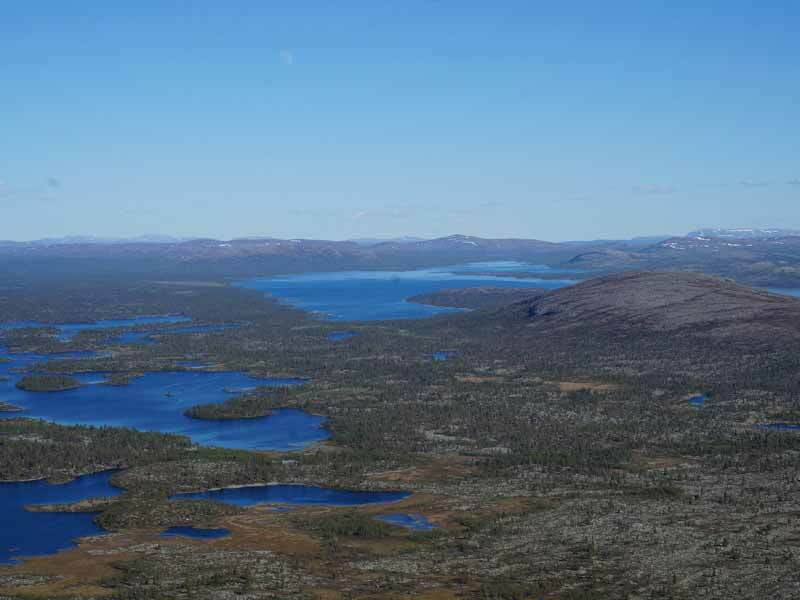 From here, your route will be dictated by the time available and weather conditions, perhaps taking you across Lake Rogen and through a series of islets to the very different landscape of the Bredå Lake area, or you may instead decide to leave your canoes and spend some days hiking in this beautiful region. There are number of options for peak hikes offering stunning views over the surrounding wilderness. You will be met at the end point at 14.00 or 14.30 (depending on end point) for transfer back to the canoe centre. You will be back in Funäsdalen in time for connections to night train departures. Start/end days Mondays, Wednesdays or Fridays between 17th June and 13th September 2019 (last start 13th September)*. There is no maximum limit to your tour duration provided your start and end days are a Monday, Wednesday or Friday. *Note that if choosing a tour at the beginning/end of the season, you should be prepared for lower temperatures. For tours in the middle/later part of September, there is also the possibility of some early season snowfall. NB: Please note that, while there is a choice of possible durations for this experience, the number of days must be decided in advance at time of booking. If you change pick-up arrangements during your tour, you will incur additional charges for custom transfer. You must plan your tour to ensure that you are at the pick-up point at the agreed time. You should choose your duration based on the length of time you wish to spend in the area rather than aiming to cover a particular distance or paddle a particular route. In general, it is not possible to judge the distance you will be able to cover and decide on the most appropriate route in advance. Some participants may take two days to reach Lake Rogen from Käringsjövallen, others may require just a few hours. During your canoe adventure you will need to take into account factors such as weather conditions, your level of fitness and experience, your varying energy levels and personal preferences, and must be prepared to be flexible and adapt your plans accordingly. NB: This experience is recommended only for even-numbered groups (2, 4, 6 persons, etc). It is not possible to paddle three persons in one canoe for this tour. For odd-numbered groups (3, 5, 7 persons etc), one person will paddle solo in two-person canoe. Please note that, due to the land transports required, this will considerably increase the level of challenge of the tour as a whole and the time required for land transports, especially if just 3 persons. NB: If travelling as odd-numbered group (not recommended), price for extra person in odd-numbered group is 2 x standard per person price. Tent: See image below. 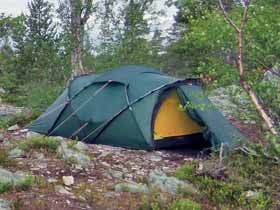 Bergans of Norway tents (sizes 2, 3 or 4 persons) are available to hire. Please note that, like all tents rated as, for example, 3 persons, the tents are most comfortable for 2 adults. However, you should bear in mind that a number of challenging land transports are required for this tour and weight carried should be kept to a minimum. The tents have inner tent and mosquito netting. The majority of tents used are Bergans Compact and Compact Lite. Specific models cannot be reserved in advance - the model supplied will be the most suitable for your needs/party size subject to availability. Cooking equipment: See image below. 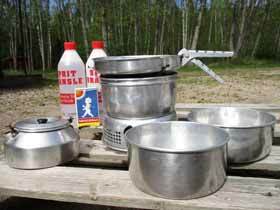 Trangia camping stove is available to hire (stove and utensils supplied may differ from those pictured below). Please note that fuel is not included. 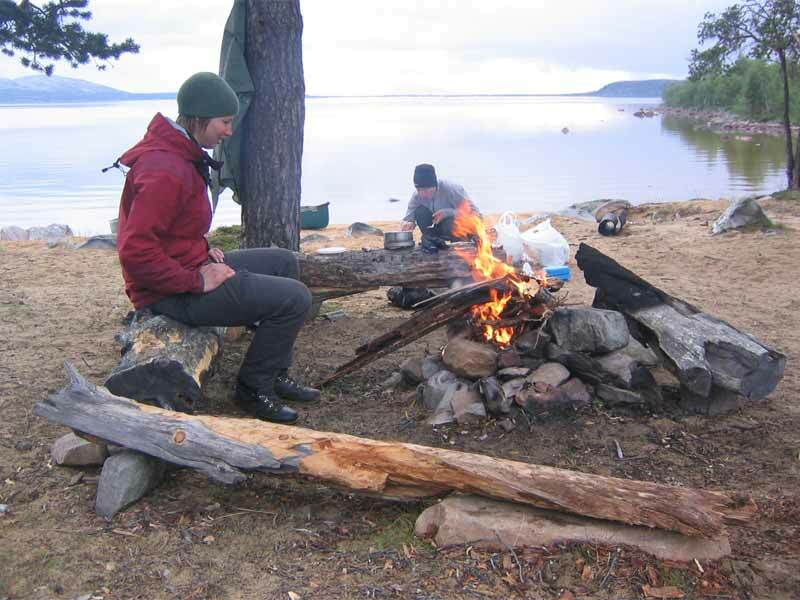 Fuel (gas or meths depending on stove supplied) can be purchased from the canoe centre on arrival. Fishing equipment: Includes rod, spinning reel and three lures in a small box (lost lures will incur replacement charge of 50SEK (approx £5)/lure). Use of wind shelters/camping spots (camping equipment not included): Accommodation is wild camping. There are also wind shelters at certain locations. If these are unoccupied, you are welcome to use these for overnight stays. Wind shelters are also the only locations at which you are permitted to light a fire. Wood is supplied. Canoe equipment: Canadian canoe 2-3 persons, paddles, buoyancy aids. Tour information: Information on route possibilities, local points of interest, facilities, security information, suggested day hikes, recommendations for overnight spots, etc, is provided. Transfers: Return transfer from the canoe centre to the start/end point for the tour. NB: Please be careful with the canoe and the rest of your equipment! If some part of the equipment should break as a result of misuse or carelessness, you may be charged for the damage caused. Map is essential for this tour - please see below. Map/route description: The tour is self-guided and you will plan your own route based on available time, level of experience and fitness, and local weather conditions. The tour cannot be done without map, which should be purchased independently. 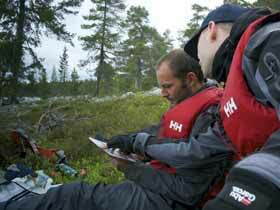 The map required is Swedish Mountain Map Series Z59 Rogen 1:50,000. Maps can be purchased from www.themapshop.co.uk or locally on arrival. Food: There is no food included. You must bring all food needed during the tour with you from the beginning. There is a food store in Funäsdalen. There is one cabin within the reserve with a small provisions store. However, you should not rely on this for essential provisions as the cabin may not be open during your tour or stocks may be limited. Swimming ability required for all participants. All participation at own risk. Minimum 2 adults required. Recommended for even-numbered groups only (2, 4, 6 persons, etc). Odd-numbered groups (3, 5, 7 persons, etc) are possible with extra person paddling solo in 2-person canoe (it is not possible to paddle three persons in one canoe for this tour), but this will significantly increase the level of challenge of the tour as a whole and the time taken for land transports, especially if just 3 persons. The tour is suitable for active families with children aged 10 and over, provided your family has appropriate outdoor experience for a self-guided tour in a remote wilderness region. Families should bear in mind that long lifts and carries of equipment are required when canoeing in this area. You should be in general good health and have a good level of fitness and strength. Depending on the route chosen, this tour may involve stretches of whitewater, normally max. grade 1. Rogen is an area of wilderness. There are no roads, no shops and no medical facilities. Contact details for local emergency services will be provided with your booking confirmation documentation. While mobile reception may be possible at certain locations, you may not have reception for large parts of your tour. Emergency communications equipment is available at one cabin within the reserve. Rogen is a very remote area with little infrastructure. As a northerly location, the water may be very cold, and in windy conditions the lake can be choppy. 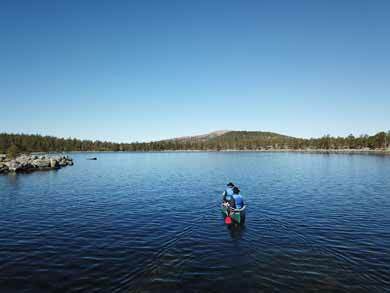 Land transports require carrying the canoe over rough terrain and can be very demanding. However, the route taken and overall distance covered is very flexible, especially if choosing a tour option with the same start/end point, so level of challenge can be varied from moderate to very challenging. Discover Wilderness Canoeing in Rogen is ideal for groups - please contact us to discuss your requirements. The Rogen Nature Reserve is a wonderful area for wilderness canoeing - a very special moraine landscape of low mountains, ancient lichen-covered pines and a labyrinth of lakes, peninsulars, bays and islands. The reserve was created in 1976 to preserve the unique natural heritage of this region. The highest point is Brattriet, at 1276m, with a number of other peaks between 1000m and 1200m. Rogen is an important area for wildlife, including three of Sweden's largest and most fascinating predators - the brown bear, wolverine and lynx. Otters also inhabit the area and with luck you may see the majestic Golden Eagle and Rough-legged Buzzard circling over the landscape. In wintertime, Rogen is visited by Sweden's only population of musk ox. You can choose to fly to Stockholm or Gothenburg airports. From here, you travel by night train + onward bus connection to Funäsdalen. You can also choose to fly to Oslo airports and travel by hire car (driving time 6-7 hours). Ferry Dover-Dunkirk or Newcastle-Amsterdam for onward train + bus connections to Funäsdalen or by car (driving time around 15 hours). Read a trip report from Bob. Rogen Wilderness Canoe Expedition is the more challenging version of this tour.